Blogging has been around for years now and it doesn’t seem to be losing popularity. Lots of people are blogging, either as a hobby or as a full time job, and you can find a blog about anything online. Many businesses and agencies have blogs on their sites as well, and you should too. Business blogs aren’t the same as the ones people write about their hobbies or interests. A blog on a business website represents the business – it introduces the products or services in a more gentle way than straight up advertising, brings traffic to the website, increases brand awareness and, if the content is really good, brand authority. Having a blog on a business site can’t do it any harm. Let’s start with purely technical benefits. It’s known that more pages on a website helps increase the visibility of the site, so naturally a blog section will increase it too. And, since a blog is something that is updated on a fairly regular basis, it creates new pages all the time. It’s also great for social media and content marketing strategy. Every time there’s a new blog post or article on a website, there’s a new opportunity to share it on social media, start a conversation and bring people to the site. 60% of businesses that run a blog on their site have seen increase in number of customers. A business blog allows business owners to share their expert knowledge about their field of business and the voice and personality of their company. Writing great articles, either by yourself or hiring a content writer, is a way of communication with both customers and other business owners in the niche. People can leave comments on the post or on social media and engage in conversation with the writer and other people. Word gets around, great and helpful articles get shared and your brand is becoming more visible, more influential. 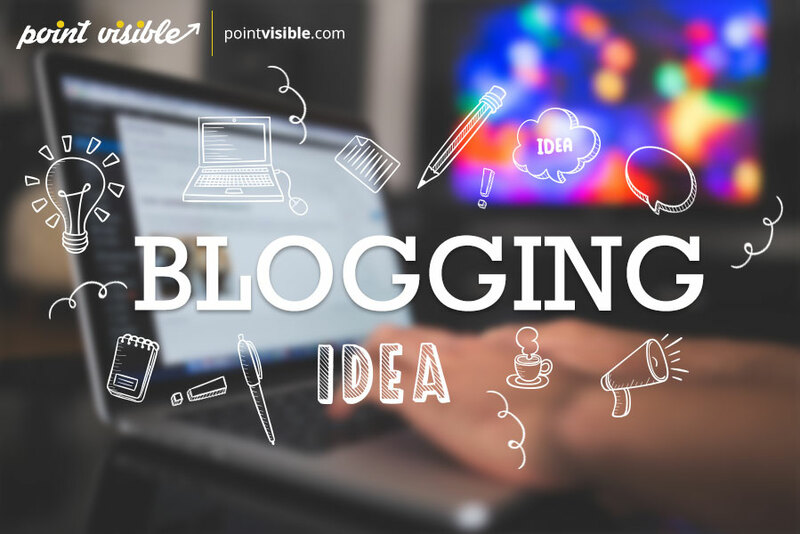 This opens opportunities for guest blogging on other influential blogs, or having influential authors guest post on your site. Possibilities are endless with blogging. Blogging brings long term results. Once the blog post is written, published and shared, it gets into search results ad it stays there. It can move up and down depending on the quality, SEO, sharing and other things, but it will be there until you delete it yourself. In fact, in future, you can easily get back to it, update it, and get fresh traffic. At the end let’s not forget – blogging is fun, especially when it’s writing about something the writer knows a lot about. It makes you think about the work you do every day, making you more focused and perhaps even solve some problems. Blogging will do wonders for online marketing campaign as well, so don’t hesitate any longer and start that blog! What to write and how often? Okay, now that I convinced you, it’s time to decide what to write about. I’m going to use Point Visible as an example of a brand new business blog. This website was built from scratch using WordPress, and has content about services we offer. We had a few sites in past but we decided this brand new service deserves a brand new website. Since this service is all about the content, it was natural to have a blog section as well. To start it off, we went through our archives and found a few old blog posts that are suitable for this site as well. It’s always a good idea to look through your old posts, even when you have a running blog and not starting from scratch. Maybe there’s an update on the topic you already wrote about, or perhaps now you have more knowledge about some topic you covered years ago. Add in a few paragraphs or even create an infographic, it will give it a nice boost and your old content will be fresh and interesting again. When you create a blog, you have to know it’s a long term decision. Website owners and bloggers are often full of content ideas when they just start running a blog. New articles are just pouring out of their keyboards and there’s perhaps even a new blog post every day. This isn’t bad, if the content is good, but it’s important to keep consistency and not stop with content after few weeks when the initial inspiration is gone. Running a blog takes dedication. It’s recommended to have 1 or 2 posts per week. That way the readers are getting new information every few days but aren’t bombed with it all the time, and the writers aren’t too pressured to constantly create new content. Determining a blogging schedule is very important, equally for writers and for readers. Readers love knowing when new articles will be up. They can fit them in their routine without having to check every day if there’s something new. Writers can easily plan their work and writing if they know when they’re supposed to deliver an article. This doesn’t mean a writer should wait for the deadline to write – it’s even better to have a few blog posts written up front and ready for publishing. One of the most important and helpful things to remember is to write everything down. Ideas for articles can come at any moment of the day. Maybe you read an interesting article about something in your niche and have a different opinion about it – write it down, save the link, and come back to it when you have time. When it comes to new content, writers can find inspiration anywhere. As I mentioned before, business blog should be about sharing expert opinion and/or brand story with readers, and there’s surely a lot of blog posts in there. Perhaps there’s a client with unusual requests that ask for a different approach to something you do. Write a blog post about it, people love to read case studies with real examples and explanations. This kind of post takes a bit more time, but it will bring lots of traffic and increase your influence and authority. Other popular posts are tutorials and guides, where the writer’s knowledge and experience really shows. Even simple tutorials on something you do every day (like blogging, hey!) can bring a lot of traffic and people will appreciate those posts the most. Make sure to include some tips and tricks you learned while working. We recently wrote a guide for finding contact info when doing blogger outreach, so you can see an example of a good guide. The people – your readers and customers – are the ones that matter, so you can always ask them what they want to read about. Avoid direct questions with searching social media and question and answer sites like Quora for already asked questions in your niche. These are great resources for blog post ideas and you can always go back to the question that inspired you and link to your article. While we’re on social media, you probably noticed there’s always some kind of trend going around. It’s sometimes a good idea to jump on it and write an article – if it’s close to your business of course. Following trends is an easy way to get traffic fast. Stay on track with sites like Google Trends and Alerts or by searching Twitter or Reddit. When you’re really stuck and have no ideas, there’s help too. Several sites have content idea generators, and they are a great help when you aren’t sure what to write about, or just need a catchy title. We used generators created by Hubspot, Portent and ContentForest, with even more content generators listed here. These generators don’t always have the best ideas – sometimes they are really funny – but they are a great source of inspiration. One more site that will help you with creating content and managing your blog is First Site Guide, where you can find tons of guides and step by step tutorials for beginners, but also for those with some experience. At the end, take a look at your competitors and learn from them. It’s hard to find 100% original idea on the internet these days anyway, so borrowing from someone else isn’t a bad thing. There’s always a different way to write about something, or a different opinion about certain topic. There have been thousands blog posts like this one you are reading now, but I have my own opinion and ideas so why not share them. Now that you have your blog post and you are proud of it, it’s time to share it with the world. First of all, the technical part. Make sure your content is SEO-friendly. This doesn’t mean you should list keywords and mention them a lot throughout the content! If you’re using WordPress, there’s a lot of great SEO plugins that will help you, like All In One SEO or Yoast. Share your new blog post on all your social media profiles, and not only on the day of publishing but also a few times after that. There are several ways to do this. The easiest one is to just copy and paste the link on social media. Don’t forget to add some text in link description, and make it catchy. Always use hashtags with your keywords or blog topic. They help people find the content they are interested in. Hashtags are more popular on Twitter and Instagram but they are in use on Facebook as well – and they can’t harm. Create graphics for sharing your article on social media. This allows you to post the same article a few times but in a different way. First you share a direct link with text. Then, a few days later, you share a graphic with the blog title, or a quote from the post, and with a link in the image caption. Images on social media get more attention and more shares than other types of posts, so it’s definitely worth to try it. You don’t have to be a graphic expert to create beautiful images for social media – we recommend using tools like Pablo by Buffer, or Canva, to create trendy social images fast and easy. Don’t move away from social media just yet! I mentioned you can search social media for inspiration when writing, but social search is great for promotion as well. Engage in discussions about the topic you wrote about, and share the link to your helpful article. Monitor hashtags on Twitter and Facebook, and answer similar questions on Quora. Join a few Facebook groups that are dedicated to your niche or topic of interest and share your article there as well. Social media is great! When you cover all the social media, you can move on to blogs. There are few ways of promoting your article using other blogs. The easiest one is definitely by leaving comments on relevant blogs. Not all blogs have a comment section, and not all of those with a comment section allow links, but there are a lot of them that do. One thing to be careful about when promoting your own blog while commenting is to make sure your comment is helpful and educational rather than just plain copy-paste URL and „hey check this out“. Those kinds of comments are considered spam and will bring a lot more harm than good. Most blog owners are active on social media and have a big following there. It’s never a bad idea to try and tweet them or post on their Facebook page and share your article. Sometimes they won’t even notice it, but they could always share it with their followers and give you valuable feedback. Last thing to do is try emails. Some businesses have newsletters set up. If you are one of them, always include your latest blog post in the newsletter. Your newsletter will be fresh, and the subscribers will appreciate new content. Besides on social media, you can contact other blog owners via email as well. Make sure it’s not anything aggressive or too self-promotional, just two bloggers with shared interests, sharing good articles. At the end, there’s a few things to remember. Having a blog section on your business site is a great thing with lots of benefits. The content that is being published has to be original, educational and relevant. Don’t write blogs just for the sake of it. Have a schedule for posting to help you organize your time and let readers know when to expect new content from your site. Promote your blog on social media and don’t be afraid to interact with bigger bloggers. thanks for the contentforest, it’s completely new tool for me! Glad you like it! The paid version has so many great stats and options, but even the free version offers a lot of inspiration for titles and topics.